Nine years after Barack Obama signed the Affordable Care Act (ACA) into law, many Democrats want to replace or supplement the ACA with a further expansion of government-provided health insurance. Their most ambitious proposal — endorsed by leading Democratic presidential candidates — would create a new single-payer program covering all Americans. While Democrats are divided over the future of private health insurance, the “Medicare for All” plan championed by Bernie Sanders would replace virtually all other insurance options. To understand why, it’s worth reviewing five important healthcare realities: 1) Health insurance does not guarantee immediate access to care from preferred providers. 2) The best healthcare systems in other Western countries do not rely on a single-payer model. 3) More than a third of Medicare beneficiaries are now covered by private- insurance plans. 4) Both current and future retirees will receive dramatically more in Medicare benefits than they will pay in Medicare taxes. 5) The entire world depends on American medical innovation — and, to a large extent, profits drive innovation. 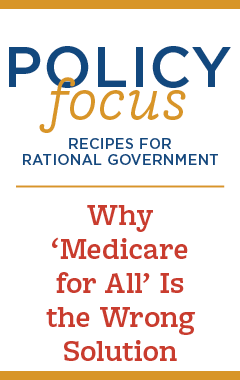 With that in mind, policymakers should reject Medicare for All and instead focus on improving access to affordable, reliable coverage while maintaining America’s innovation edge.